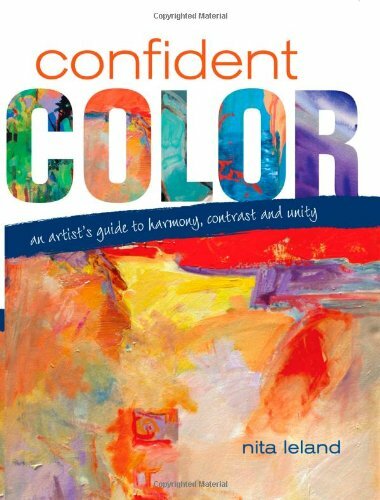 Confident Color is a wonderful book on colours and usage written by artist Nita Leland. I bought this book months ago, and ever now and then when I pick it up to read again, I still get inspired, and get new ideas on playing with colours. It covers the different school of thoughts when it comes to using colours. It has sections that teach colour usage based on graphic design elements and principles. It's quite interesting because I don't see many other books do this. And the concepts displayed are certainly useful when it comes to designing, composing your own drawing or painting. What I like best about the book is the section that covers colour harmony. It goes through several palettes, each with three primary colours, talking about their unique characteristics and how they differ from other palettes. You can mix all sorts of colours using three primaries, but some palettes will achieve colour ranges that other palettes can't. All that is explained here. If you ever wonder why you mix mud ever so often, this book also explains that and has the solution for you. The last chapter has several step-by-step tutorials from guest artists talking about the colour choices of their paintings. And throughout the book, there are many beautiful artworks featured as examples to illustrate the lesson points. Most examples are watercolour, including many from Nita Leland herself. This is a book with lots of great tips. Highly recommended to beginner and intermediate artists. Two other books on colours that you might also want to check out are Making Color Sing by Jeanne Dobie and Color and Light by James Gurney.